Well, some will argue that it did get a release and the full game entry in Gamebase also suggests that is the case, but it never got an official Codemasters release. 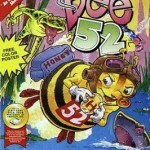 Although reviewed in Commodore Format (and I think Commodore Force without my scans to hand to confirm), Codemasters decided that sales were too poor now for the C64 and decided to not release the game (even though it was complete). So no fanfare or final fairwell it seems. However the game’s author Nick Taylor, presumably already a bit narked that his other game Grell and Falla had a similiar fate a little before, come to an agreement with Codemasters to release the game himself via mailorder. There was no fancy inlays, just a basic disk with instructions that were apparently photocopied from a standard set that Codemasters produced. However it was through this that the game inevitably got cracked and spread. 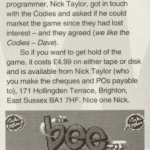 Sadly Nick didn’t get too many sales, but its thanks to Nick trying that the game has managed to get out in the way it has. Although this is not a GTW to be hunting for, it is one which never got officially released and one we should give an entry for to preserve its story. Scans of the reviews and other related materials will come soon! For now, if you haven’t checked it out already, grab a copy of this excellent full game and enjoy!. I remember a demo appearing on either the Commodore Force cassettes or the Commodore Format cassettes… can’t honestly remember which off-hand. I have loads of CF magazines still at home somewhere so might double check if it was on their magazine. 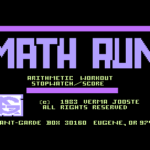 It was just a quick demo of Level 1, if I recall correctly, and then the game just vanished altogether before appearing as a mail-order-only deal near the end of the C64s time. The demo appeared LONG before the game was released via mail order. I remember that I loved the demo but could never get a hold of the game for months and months afterwards (maybe even up to a year or more). I actually ordered this game (back in the day) via the mail order process and received the Cassette version. Still have it somewhere, too. Loved the game, it was quite well received as I recall. Not the greatest game ever made but a simple, fun and original concept. The biggest problem that I remember with this game is that, especially on later levels, you needed the pollen from every flower on the level in order to complete the level. However, if you died while retrieving the pollen, all flowers previously accessed would remain closed – so if you had taken pollen from a flower and died before bringing it back to your hive you ended up losing both the pollen AND the chance to retry going to that flower. Subsequently, then, you couldn’t gather enough pollen to complete the level should you encounter some deaths during the level. A tough game – requires a LOT of patience and skill. Thanks Anthony – the game was pretty cool, and we were lucky that Nick released it himself. Shame the other Codies games didn’t go the same way!